Sweet Libertine and Vivid Lacquer contest! 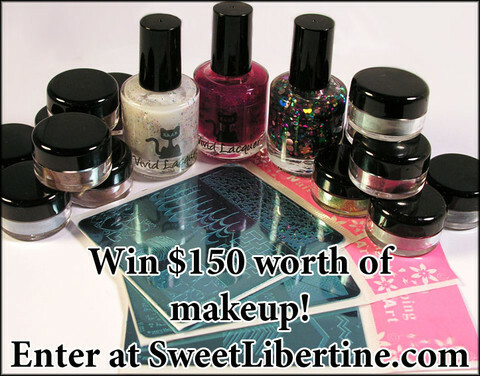 One of my favoritest companies - Sweet Libertine - is joining forces with Vivid Lacquer for an amazing contest! $159 worth of makeup, polish and plates? SIGN ME UP!!! You can enter the contest here! Please note that by using the link I provided, you will give me extra entries in the contest. If you prefer NOT to give me extra entries (hey, no worries! ), you can use this link to enter.